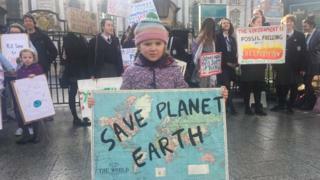 A protest has been held by young people in Belfast to call for greater government action on climate change. Some students walked out of their schools to attend the demonstration at the city hall. They were joined by a number of families who'd brought young children to the rally. It's part of a series of protests across the UK today to highlight the issue. Around 40 people turned up at the event. Jasmijn Hofmann said she had taken part of the day off school to attend the rally because climate change was an issue that was affecting people now. She insisted protesting had an important role in raising awareness of the issue and said young people were also sending out a message to politicians. "We are the voting bloc of the future, it shows that we are politically active and this is an issue we will be voting on and therefore the politicians have a duty to represent us." She said that meant parties putting climate action at the heart of their policies "otherwise we just will not won't vote for them". Rachel Agnew had travelled from Broughshane for the event with her children Archie, eight, and five-year-old Bea. "I brought the children because I think it's about their future and it needs to be protected"
"There's an element of complacency and much much more needs to be done, and now is the time." The Belfast protest is part of a series in cities across the UK today. There have been similar demonstrations in other European cities. They follow a warning from the UN that carbon dioxide emissions need to be halved in 12 years if a key target on global warming is to be met.